Our company Ekspertneftegaz Ltd engaged in the production of hard alloys. To monitor the quality of the products, and also for the selection of the hard alloy’s mark for specific tasks, it was decided to purchase a microscope with a web camera. We obtained the Altami MET 1C metallographic microscope together with Altami Studio program. Altami Studio has an intuitive interface, allowing quickly and easily set up the camera, its resolution, color correction and working with it to take pictures and videos, etc. But the most important that the program allows you to measure the pore sizes and grain WC using a variety of tools. It is easily calibrated using a special calibration plate, so that the calibration does not cause difficulties. Sometimes there were questions on the use of certain tools, but the answers can be always found in the “help” tab by pressing F1. In this manual you can find answers to practically all questions arising in the process of working with Altami Studio, and if this is not possible, the Altami experts were always glad to help. They quickly answered questions and advised by telephone and by e-mail. The quality of hard alloy as well as its physical-mechanical properties directly depend on its microstructure, in particular grain size of WC, the value of the cobalt interlayer, porosity, phase composition. 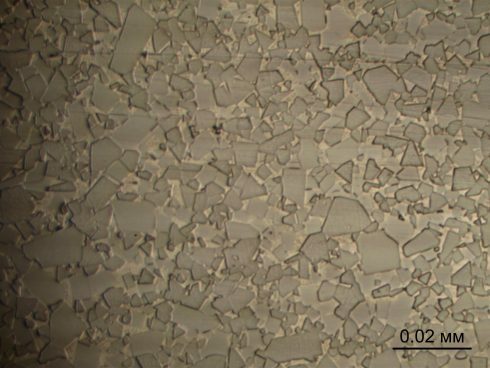 For example, with the same content of cobalt binder in the alloy, but different WC grain size hardness values will be higher in the alloy with finer microstructure and hence the wear capability will be better. Below are pictures made with the Altami equipment. With a microscope “Altami MET 1C” and the software Altami Studio, we control the quality of hard alloy according to the parameter of porosity. One of the important performance characteristics of hard-alloy strength depends on porosity. The smaller the pores, the stronger the alloy ( with the same parameters of the phase composition, the same “grain”). Below is an example of a material of poor quality which was detected with the Altami equipment. In conclusion, we would like to add that the Altami products completely satisfied our needs in light microscopy and are suitable for metallographic tests according to GOST 9391-80. But to automate the process of calculating the average grain size and bulk porosity the software lacks the necessary functions. It would be great if Altami team will be able to implement these possibilities in the future. The company provides quality and efficient service to support the software. We express our gratitude to the Altami company for their excellent products and quality technical support!